Almost flat land with river passing through. There is a legal access road leading to the land from the second layer onwards. 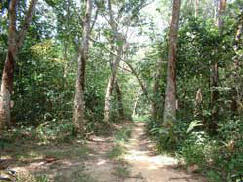 This photo shows the laterite road on the first layer. 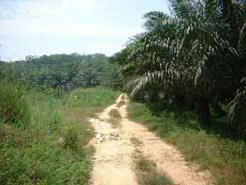 This is the internal road on the land. The land is generally flat and the soil looks fertile. Another view of the land. 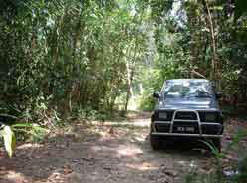 Here one can see that the rubber trees are quite old but still being tapped. 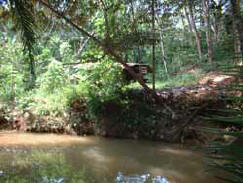 This photo shows the river which runs the whole length of the land. The river is about 10-15 feet wide. Across this river the land is slightly hilly, but overall the land is flat.